Hello friend! I hope you’re staying warm and safe this month! Here on the East Coast we got hit with a ridiculous storm that turned everything into a sheet of ice. People were skating down the roads and, in a peak Canada moment, even through the Tim Horton’s drive-thru! Needless to say I’ve been trapped inside for the last few days, apart from what should have been a short walk to the corner store that took me over half an hour. So what do I do when I’m stir-crazy and mildly bored? Binge amazing Australian reality TV on Netflix of course 😉 Oh and work on creating some new recipes! If you haven’t watched Instant Hotel yet and you’re storm-stayed, do yourself the favour and make a batch of these cookies and check it out. 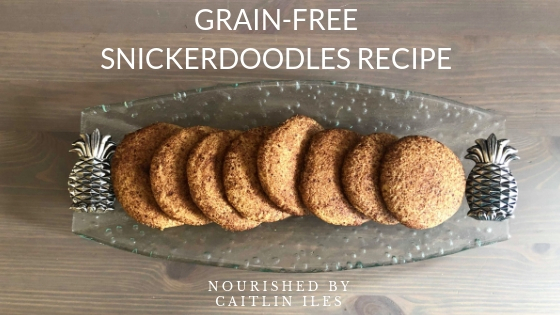 Last night I had an intense craving for a cookie I’ve probably had twice in my entire life and so I decided to take a grain-filled, inflammatory, sugar-laden recipe and turn it into something that, while still a treat, will be much better on blood sugar balance and the health of your digestive tract. The base of our cookie is almond flour, which is packed with protein and fibre to help prevent too much of a spike in insulin. They’re also coated in cinnamon, which helps our cells more readily absorb glucose in the bloodstream. I try to have some cinnamon every day not only because of this helping hand, but because it’s so delicious! I’ve also subbed out typical white and brown sugar with my favourite dry sweetener, coconut palm sugar. It has a much lower glycemic index and a delightful caramel flavour! You can pick it up at Costco at a very affordable price. Alright, let’s get to the deliciousness! 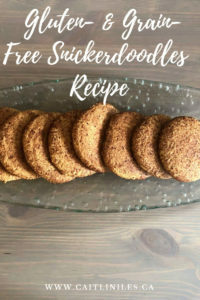 This recipe uses a base of almond flour to create the perfect cookie that's crispy on the outside & soft & pillowy on the inside! The perfect healthy indulgence! In a medium mixing bowl cream together butter and coconut palm sugar. Once mixed, crack in the egg and add the vanilla. Mix again until thoroughly combined. In a separate bowl stir together almond flour, tapioca flour, baking powder, and sea salt. Pour dry ingredients into wet and mix thoroughly. Set in the fridge a few minutes to harden. It will still be somewhat of a wetter dough. While setting combine coconut palm sugar and cinnamon in a small bowl. Remove from fridge and roll into balls. My suggestion is to coat hands in coconut oil and then wet them periodically to keep the dough from sticking too much. Feel free to lick any extra dough off your fingers! Roll each ball into the cinnamon mixture and place evenly spaced on the baking sheet. Once all balls are coated gently squish each one with the flat bottom of a drinking glass. Place in the oven for 11 minutes. Remove from oven and let cool a couple of minutes on the baking sheet before transferring to a cooling rack. Well friend, that’s our delicious wintery indulgence recipe for today! Stay safe and warm wherever you are! Just made these and they are awesome! Thanks for the great recipe Caitlin!